There are many theories and speculations that abound today regarding this mysterious “Mark” of 666. Some believe that it is a microchip under the skin or a bar code on products or even a tattoo in a person’s forehead. But there are some problems with these interpretations that do not hold up under close scrutiny. For one thing, it is quite possible for someone to pin a person to the ground and forcefully implant a chip in their skin even against their will. It is also possible to do the same and give them a tattoo or a bar code. That tells me that it cannot be the Mark of the Beast – because at some point, you will not have control over whether they give it to you or not! But Revelation 13 implies that though there will be forceful persuasion, bribery, and deception taking place – each person will still have the choice whether they will accept the Mark of the Beast or not - for some refuse to receive it (Rev. 15:2, Rev 20:4). 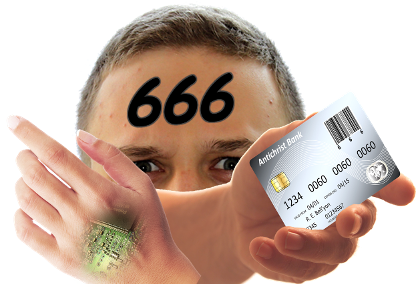 The Mark of the Beast is something that, in rebellion to God, each person on earth (those who accept it) will make the conscious choice/decision in their mind to accept (represented by the ‘frontal lobe’ or critical mind - “forehead” – Rev. 13:16, Jer. 3:3) or they will just go along with it, for convenience sake, by their actions (represented by the hand – Rev. 13:16, Eccl. 9:10). They will have to choose whether they will take the right way or the easy way. The right way will lead them to reject the Mark and they will be sentenced to death (Rev. 13:15). The wrong way (receiving the Mark) will enable them to buy and sell (carry on life as usual) (Rev. 13:16, 17). You will find that many books and studies have been produced which identify what this “Mark” constitutes, with many interesting details – but in this study, I am simply pointing out a few points, basically just a brief summary, of this important topic. 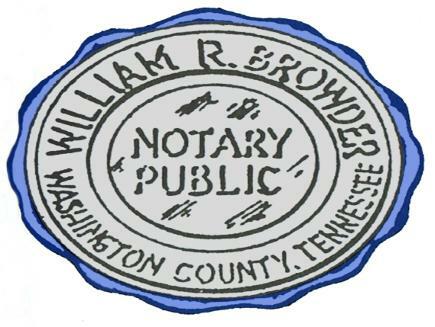 First notice that there are three separate items – the Mark, the Name, and the Number – here we are only dealing with the “Mark”. Now the Bible is the Word of God and as such – it always interprets itself! So instead of speculating and trying to concoct our own ideas of what the Mark of the Beast is, we should let the Bible tell us itself! You will notice, by reading through Revelation 13, that the issue is about “worship” – and this would agree with the other parallel passages in scripture. Ever since man was created and fell into sin, the tests have continually been over the issue of who we are going to choose to “worship” – God or Satan! 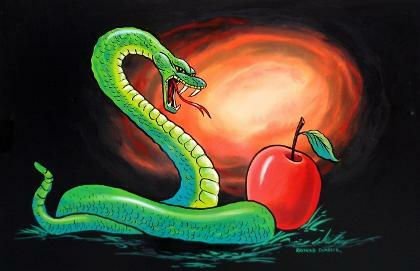 This was Eve’s test in Eden – who she would believe and obey – God or Satan. She chose “Self” which is what Satan uses to entice us to follow him! Now the Bible describes two beasts in Rev. 13. The first beast comes out of the sea and it has seven heads and ten horns. It is a composite beast having parts of a leopard, a bear, and a lion, and it receives its power and authority from the dragon. To begin to understand what God is telling us here, we should look to see where in His Word He talks about a beast coming out of the sea – and we find that this is a parallel passage to Daniel chapter 7. 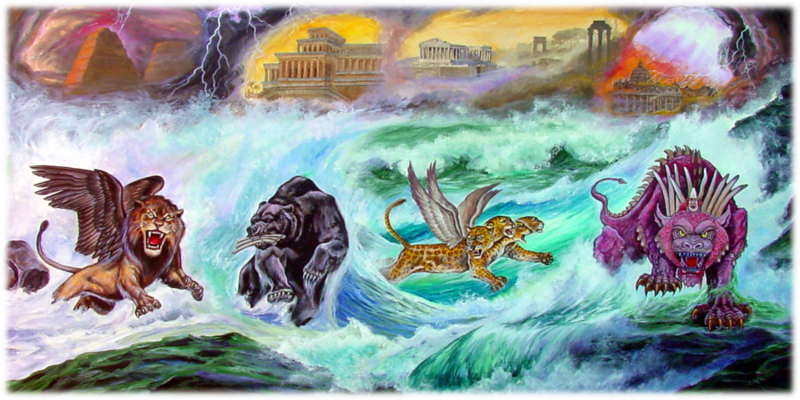 In Daniel 7, we see 4 beasts that are coming out of the sea, a lion, a bear, a leopard, and a terrible beast (maybe like a dragon?). You can see the parallels to Revelation 13’s first beast. The sea represents populated areas, places with many people (Rev. 17:15). 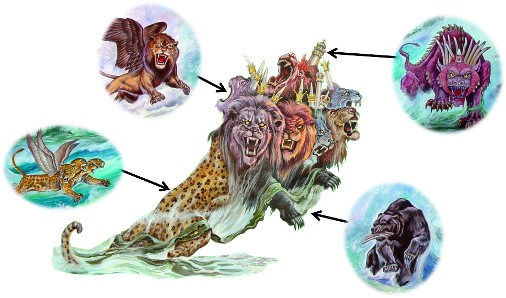 Daniel 7 describes these 4 beasts and their characteristics – then in Daniel 7:17,23 it identifies these beasts as kingdoms or what we would call “Political Powers”. By comparing the characteristics of these kingdoms, we see that they are the same kingdoms that are described by the metals in the image of Daniel chapter 2. 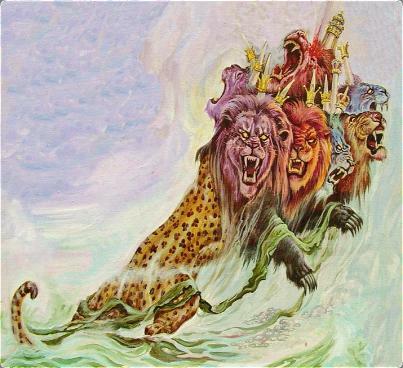 So if you carry all this symbolism over to the book of Revelation, we find that the first beast of Revelation 13 has the body of a leopard (Greece) the feet of a bear (Medo Persia) the mouth of the lion (Babylon) and it gets its power, seat, and authority from the dragon (Rome). In other words, this “beast” (kingdom/political power) is composite – it is incorporating the different characteristics of the kingdoms before it – it is blending them together into one power. Now these individual characteristics are really fascinating. Feet in the Bible represent a person’s actions, the way a person walks (Psalm 119:101,105), so the feet of Medo Persia (bear) would be the characteristics of the actions of Medo Persia. What type of actions was Medo Persia known for? In the Bible, the mouth represents speech, it is how a person talks (Exodus 4:15,16), so the mouth of Babylon (Lion) would be the characteristics of the talking/speech of Babylon. What type of speech is Babylon known for? In the Bible, the body can represent teachings/doctrines (Matt. 26:26; John 1:14), so the body of Greece (Leopard) would be the characteristics of the teachings/doctrines of Greece. What type of teachings is Greece known for? Also notice that this Rev. 13 beast (political power) is also a religious power that claims worship (Rev. 13:4). So this first beast/kingdom/political power of Rev. 13 has these characteristics. It arises from a populated area. It claims that it doesn’t change. It speaks pride and blasphemy. It teaches higher criticism & Greek philosophy. It displays intolerance for those who follow and obey the true God (Rev. 13:7). And it received its power and authority and its seat (headquarters/capital) from Pagan Rome. There is only one “religio-political power” that can fit that description, and that is Papal Rome, otherwise known as the Papacy. Is the Papacy a religious & political power? Yes! Did the Papal Church arise in the populated countries of Europe? Yes! Did the Papal Church receive a deadly wound that was later healed? Yes! 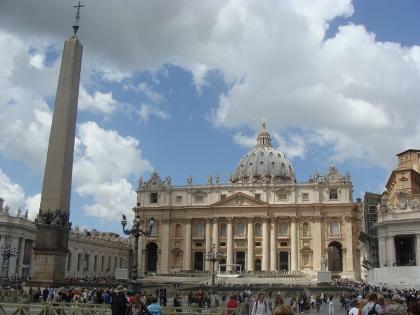 Is the whole world “wondering” after the Papal Church? Yes! Just check the current news headlines! Does the Papacy claim infallibility (that it doesn’t change)? Yes! Does the Papal system speak pride and blasphemy? Yes! "The Pope is not only the representative of Jesus Christ, but he is Jesus Christ, hidden under a veil of flesh." "Our Lord God the pope; another God upon earth, king of kings, and lord of lords. The same is the dominion of God and the pope. To believe that our Lord God the pope might not decree, as he decreed, it were a matter of heresy. The power of the pope is greater than all created power, and extends itself to things celestial, terrestrial, and infernal. The pope doeth whatsoever he listeth [wills], even things unlawful, and is more than God"
Does the Papal Church promote Greek philosophy and higher criticism? Yes! Does the Roman Church display intolerance for those who obey God? Yes! Did the Papacy receive its power, seat, and authority from Pagan Rome? Yes! Now notice that as Papal Rome is being “taken into captivity” (Rev. 13:10) which took place in 1798 when the French general Berthier captured the pope and put him into exile – that another beast/political power was rising into power (Rev. 13:11). This power instead of coming from a populated place, arises from the earth (which would be opposite of the sea). What world power was rising into power sometime around 1798 in an “unpopulated” place? There is only one world power that fits that description – the United States of America that came into power in what was called the New World! Now notice that this 2nd beast has 2 horns like a lamb but it speaks like a dragon. Horns in the Bible represent strength (Ps. 18:2) and of course, the lamb represents Jesus Christ (John 1:29). So this country, the United States of America, has 2 things that are its power and strength that are characteristics of Jesus Christ – that would be the two principles that this nation was founded on – Civil and Religious Liberty! But the text also says that it “speaks” as a dragon. Now the ultimate “dragon” is Satan (Rev. 12:9) but he also works through people and powers that he can get under his control. That is why the dragon also represents Paganism. Rev 13:12-15 And he exerciseth all the power of the first beast before him, and causeth the earth and them which dwell therein to worship the first beast, whose deadly wound was healed. And he doeth great wonders, so that he maketh fire come down from heaven on the earth in the sight of men, And deceiveth them that dwell on the earth by the means of those miracles which he had power to do in the sight of the beast; saying to them that dwell on the earth, that they should make an image to the beast, which had the wound by a sword, and did live. And he had power to give life unto the image of the beast, that the image of the beast should both speak, and cause that as many as would not worship the image of the beast should be killed. Notice that the 2nd beast (United States) displays the same intolerance that the 1st beast (Papacy) did, and that it will pressure everyone to worship the 1st beast. Notice also that it finally gets to the point that those who refuse to go along with the demands of the 2nd beast are sentenced to be killed. This is religious persecution in the extreme! Both God and Satan have their sign or mark of authority. Which one will we choose to have? As you will see, the Mark of the Beast is a specific issue, but on a secondary level, I believe that the principle of the Mark of the Beast test can be found in any issue where we take man’s word instead of God’s Word! Notice that the “Mark of the Beast” is contrasted against obedience to “the commandments of God”! Does the Law of God identify His mark or seal? If you look at a ‘seal’ of any leader or official, you will see three components. Do we see these components in the 10 Commandments? If you go and read the 10 commandments in Exodus 20:1-17, you will notice that the first 3 commandments refer to God – but they do not identify who that “God” is. You will also notice that the last 6 commandments only talk about our duty to our fellow man. But in the heart of the Law of God, in the 4th Commandment, we find the Seal of God! 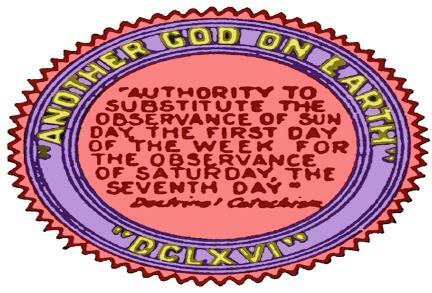 This places the 7th day Sabbath as the “Sign” or “Seal” of God. Does God confirm this interpretation? The Hebrew word translated “sign” here is “Oath” and it literally means “Mark”. 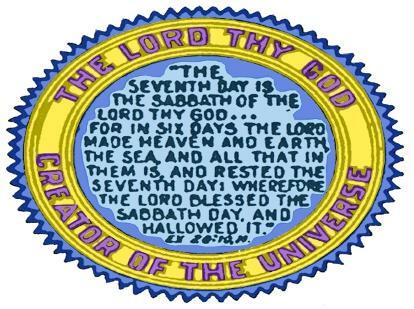 The 7th day Sabbath is literally “God’s Mark” – it is the evidence that He is the Creator and the True God! Think about this for a minute. We get our time period of a “day” from how long it takes the earth to make a complete rotation on its axis. We get our time period of the month from how long it takes the moon to make its complete rotation around the earth. We get the time period of our year by how long it takes the earth to make a complete circle around the sun. So where do we get our 7 day week? The only place we can trace that cycle is to the story of Creation. 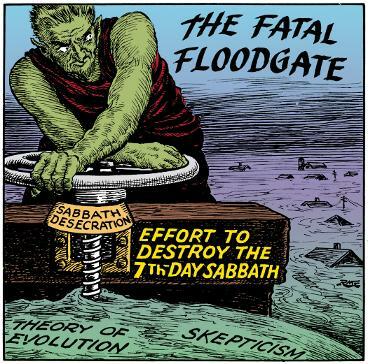 The weekly cycle was established by God Himself as He created this earth, and when He was finished with His creation – He sealed it with His Seal – the 7th day Sabbath. Where do we get the Sabbath? We get it based simply on God’s authority as the Creator and Law Giver – God said it, and that settles it. On the other hand, the devil wants to usurp God’s authority and he is in constant war against the Law of the Creator. His desire is to take the place of God (Isaiah 14:12-14). As such, all powers that he can get under his control, will also be in direct rebellion against God and desire to “change” God’s laws (Daniel 7:25), especially the one that is related to time, since it is God’s special Seal! Has the “beast” power done this? “Q. Which is the Sabbath day? "Protestants ... accept Sunday rather than Saturday as the day for public worship after the Catholic Church made the change... But the Protestant mind does not seem to realize that ... in observing Sunday, they are accepting the authority of the spokesman for the Church, the pope." the “Mark of the Beast”! Just like the authority for the "7th day Sabbath" is based solely on the authority of our Creator God - the authority for "Sunday" worship is based solely on the authority of the beast power! But notice that the general implication of Revelation 13:15-17 is that this “Mark” is being forced on people. 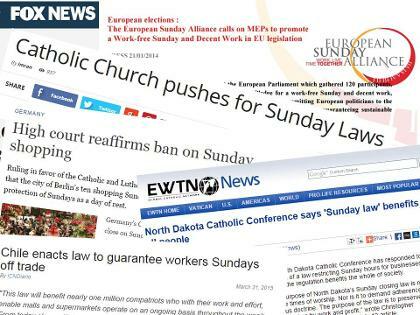 In other words, Sunday is the Mark of Rome’s authority, but it doesn’t take the prophetic stage until the 2nd beast, the United States, places laws in place to enforce its observance. Are law makers becoming more inclined to favor enforcing Sunday worship? 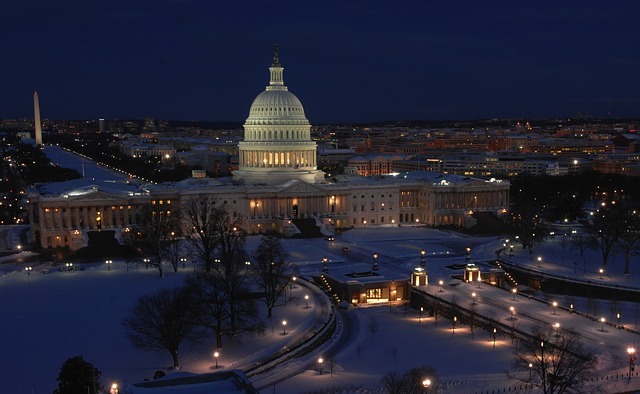 Are there any movements taking place in the legislative world to enforce a day of worship, namely Sunday? In other words, most people don’t know the issue about Sunday vs. Sabbath. They worship on Sunday because that is the tradition that they were taught and they honestly believe that is following the will of God. God understands this, and He judges them accordingly. But the final test is on the horizon. The truth of the Sabbath vs. Sunday issue is coming to light. All men on earth will be tested, just as Adam and Eve were tested, to see if they will obey the Creator who says in John 14:15 "If ye love me, keep my commandments", or if they will instead follow the decrees and desires of men.